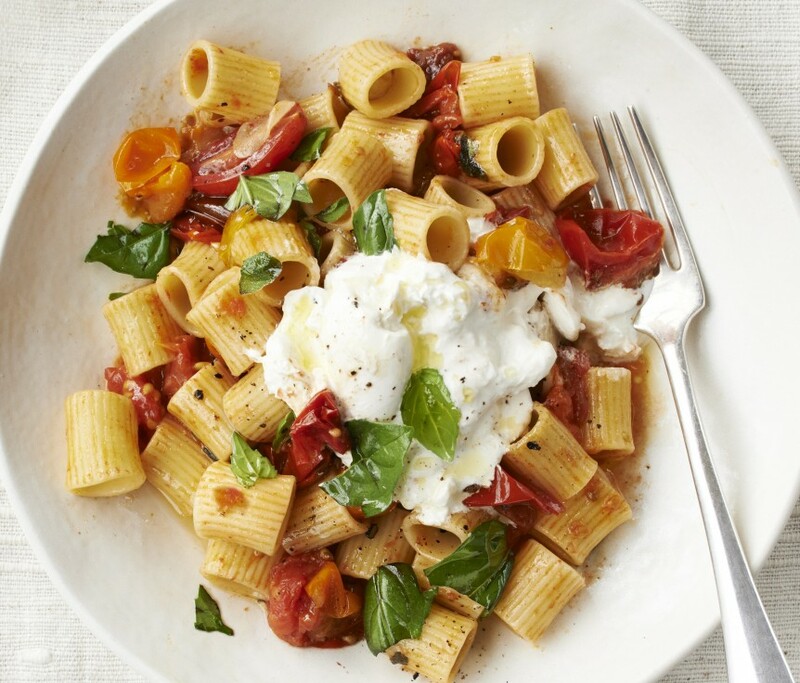 This tomato sauce is cooked twice – once in the oven and once on the hob – for the best rich sauce that clings to the rigatoni. Preheat the oven to 200C/gas 6. Put the tomatoes on a large baking tray, and season. Scatter over the garlic cloves, thyme sprigs and bay leaves then transfer to the oven and roast for 25 minutes, until the tomato skins are burnished and split. Let the tomatoes cool for a minute or two, then pull them off the vines and place in a frying pan with the red wine vinegar and a pinch more salt and pepper. Squash with a spoon and simmer for 15 minutes, until you have a thick, strawberry-red sauce with an almost creamy consistency. Bring a pan of salted water to the boil and cook the rigatoni according to the packet instructions. Drain, reserving a cupful of cooking water, and add to the sauce with a little of the water to loosen. Drizzle over a good glug of olive oil and serve with grated ricotta and a scattering of basil leaves, if you like.